I hope you all are gearing up for the Christmas and New Year holidays as I am. With many parties, marriages and family gatherings lined up for me, I am busy readying myself to look the best and so it has been a little slow on the blog since the last few weeks. *Read about some Simple Steps to achieve that Perfect and Beautiful Skin without taking out extra time from your schedule! However, while I have been away I have managed to try some really cool beauty products- some of which I had bought or received a while ago but just didn't get the chance to try and others I have just bought to try on! As you remember, I attended the launch party of Spawake in India in May this year and received the complete range to try out. 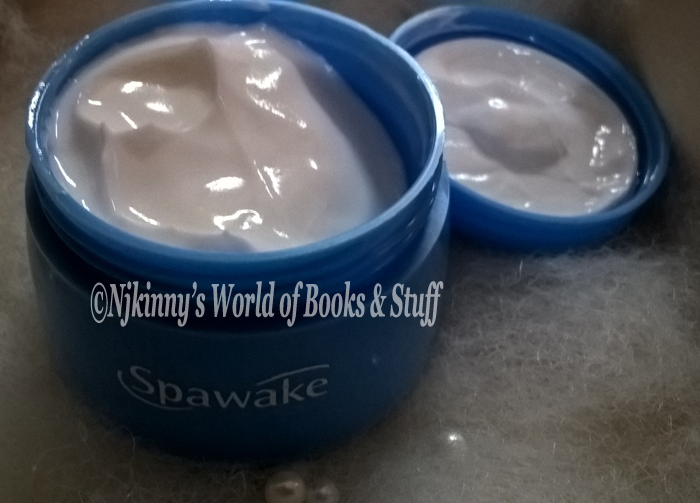 While I used and reviewed the Spawake Whitening Scrub Face Wash while also trying the other products, I didnt get down to writing my thoughts on the other products until now. 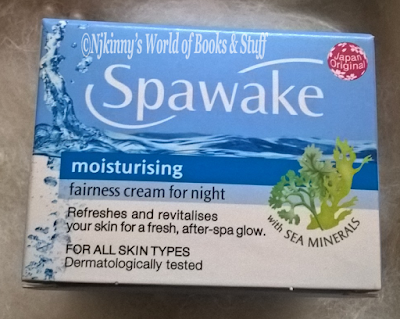 Today, I'll share my impression of Spawake Moisturising Fairness Cream For Night with you which I have been using since the last few months and really loved the overall effect on my skin. 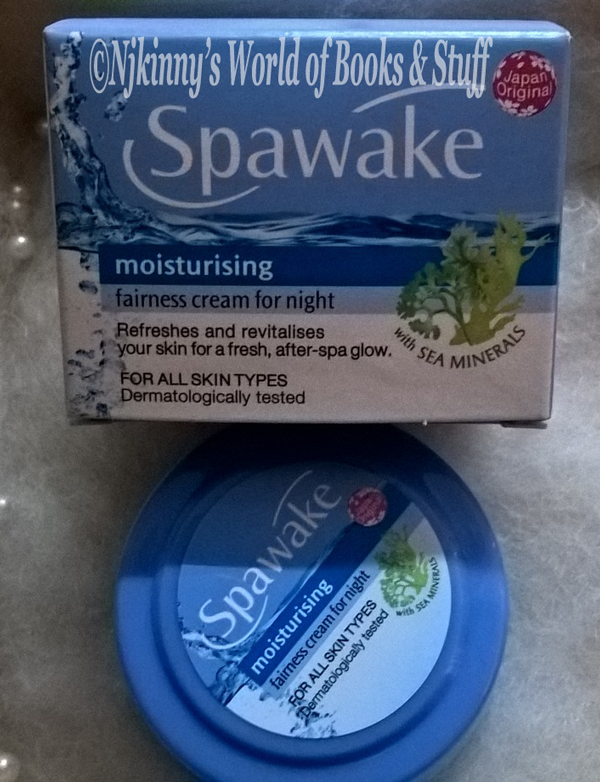 Spawake Moisturising Fairness Cream For Night is a night-time moisturiser that nourishes and recovers your skin overnight with nutrient-rich sea minerals and Vitamin E. Continuously moisturises for 8 hours* to sleep off the damaging effects of environmental stress such as UV rays, dryness and pollution. - Contains a generous amount of beauty ingredients like minerals, which intensively repair damaged skin exposed to environmental stress factors during the day like UV rays, dryness and pollutants, while you sleep. - Hydrating effects last for 8 hours. Your skin is continuously hydrated throughout the evening. - The next morning, your skin feels brand new, appearing fairer and softly hydrated from within. - Spreads easily with a smooth texture. 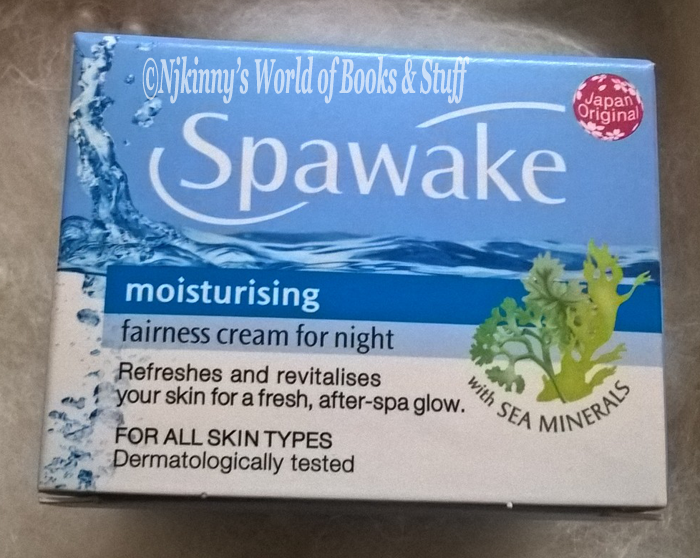 Spawake Moisturising Fairness Cream For Night is a white opaque cream which is light and not too thick with a floral fragrance that is pleasant and leaves a lingering fragrance on the skin which is light and not too pungent so as to be irritating to our nose. It comes in an opaque blue tub and the price is affordable. - The packing is sturdy. The blue tub has a capable lid and an additional second white lid that prevents the cream from spilling. - The product is easy to carry around in our purse because of the sturdy packing. - The cream is not too thick and neither too thin so as to make it runny. It is just the right texture. - It is easy to apply and gets easily absorbed by the skin. - The floral fragrance is light, soothing and very pleasant. I love the smell and the lingering fragrance that it leaves behind on the skin after application. - Just a small glob is enough for the entire face and neck. - The cream moisturises the skin and leaves it feeling soft and supple. 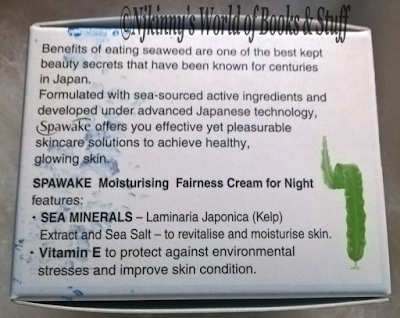 - It contains natural ingredients like sea weed, sea salt and vitamin E: all of which are known skin beauty enhancers. - The price is affordable and one tub of the product lasts longer because only a small quantity is required for a single application. - It relaxes the skin and doesn't darken the skin complexion. - It doesn't make the skin oily. - The skin looks healthier, shinier and softer right after the first application. - It removes tanning and lends a fairer look to the skin. - It is suited for all skin types. However, for extra oily skin, I would recommend using even lesser quantity than you would use if you have combination or dry skin. - Impressive shelf life of 3 years. - While Spawake products are available in majority stores in my area, availability maybe an issue in some parts of India but it is available online. - The skin looks oily in the beginning. Some extra massaging is required. - The product does contain some chemicals. 249 INR for 50 gm and 129 INR for 25 gm. 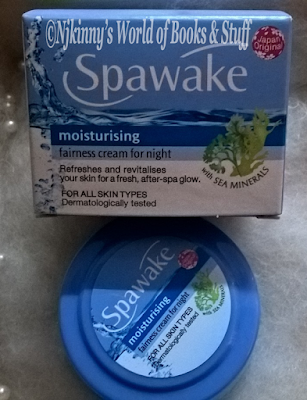 Spawake Moisturising Fairness Cream For Night is a great product from Spawake and I loved using it. It fulfills all the claims it makes and I felt my skin getting more beautiful, soft and healthy with each application. I know I am going to buy it again when my present tub finishes. However, if you are allergic to chemicals or avoid products with chemicals then you should check the ingredients first and then buy it. 4 out of 5 to Spawake Moisturising Fairness Cream For Night from me and recommended to everyone.